This black fur bolero shrug jacket was especially made for attending our friends’ winter wedding. It’s made with rabbit fur. Some gray knit fabric remnant are also used for sleeves lining. A furry bolero shrug jacket is always fashionable for attending weddings and special occasions. As it turned out, we had such wedding to attend. With an elegant dress to wear and no suitable outerwear, the timing was perfect for making this fur bolero shrug jacket! Using this helpful and simple image on Pinterest, the muslin fabric is used to create a prototype. After some adjustments, the final pattern is transferred to the fur piece and polyester fabric. There were some leftover fur pieces, which were then glued on to the polyester fabric as center lining. As for the sleeves lining, because there are no fur left, I used two pieces of gray knit fabric (leftover from previous DIY project). They are stitched on, and the edges are then covered by glueing the fur edges towards the inside. 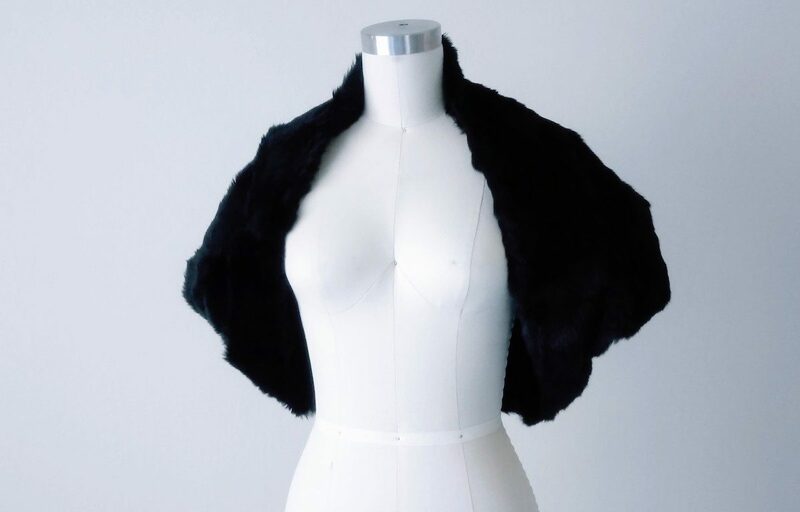 The black fur bolero shrug looks really elegant, and it fits really well. It can be worn as a jacket or off-shoulder depending on mood. I’m looking forward to wear it again in the future! This black fur bolero shrug jacket was especially made for attending our friends' winter wedding. It's made with rabbit fur patches and some gray knit fabric leftover from previous project.